Because there’s no other way to fight. Baha’is don’t oppose their governments. In astonishingly steadfast adherence to the principle of unity and the practice of non-violence – never mind non-violence, they don’t even hold with any kind of partisan division – this community does not seek to undermine even the most corrupt of human institutions. (My son, the prison advocate, finds this position intolerable; he fights the power. Good for him.) For the Baha’is, process is everything; united, peaceful outcomes do not arise from divisive, violent actions. They choose another way entirely. To aid their unjustly jailed sisters and brothers in Iran, diplomatic efforts and public appeals outside the country – not letting the Iranian government off the hook for its domestic abuses – are the only acceptable way. Baha’is within Iran are not only profoundly vulnerable to governmental, clerical, and mob attack, but also refuse in principle to bring further disunity to their already fractured nation. Because The Seven are only the most recent symbols of over 150 years of persecution. Listen: since the 1979 Iranian revolution, over 200 prominent Baha’is have been murdered or executed, and many thousands more displaced or fired from their positions. Two generations of Baha’i youth have been refused entry to university, simply because of their faith affiliation. And this is only the most recent flareup of Iranian (and before that, Persian) societal scapegoating of the Baha’is. Tens of thousands of murders, often public, massive and horrific, have punctuated the last two centuries, to say nothing of banishments, property demolitions, graveyard desacrations and vicious character assaults on an entire population. It is religious bigotry, unrelenting, on a monumental scale. Because their innocence is touching, and their resilience is a marvel. The Iranian government has nearly 100 Baha’is in jail on trumped-up charges, but they aren’t alone. Teheran’s infamous prisons are filled with thousands of others who got caught backing the wrong horse in Iranian politics, or who have actively opposed the Islamic Revolution in ways that would not have seen them jailed in democratic countries. (There are many just caught in the wrong place at the wrong time.) The Baha’is, though, are thrown in jail for activities like leading children’s education classes, or providing training to youth deprived of university. 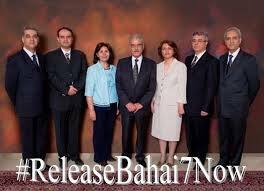 The Seven, these “Friends” of the Baha’i community, simply formed a group, with the approval of the government (! ), to assist the Baha’is in their daily lives – this, after the serial killing of members of elected Baha’i councils, and finally the outlawing of these non-partisan “Spiritual Assemblies”. The Yaran, then, were aiding the Baha’i community to pursue, under more or less severe forms of ongoing oppression, its mandates: universal peace, universal education, gender equity; in short, promoting human well-being and harmony and the general “betterment of the world”. Then they were thrown in jail, on charges like “propaganda against the regime”, “opposing Islam”, “immorality” and, my (least) favourite, “espionage”. (The Baha’is have been labelled, over their history, as spies for Russia, Britain, the United States and Israel, among others. Such a flexible accusation!) These and many other alleged crimes are the sheerest of fictions; these people, today and historically, are oppressed solely due to their belief in and practice of the Baha’i Faith. And here’s the thing: no matter what is done to them, nothing stops the Baha’is. Their resilience, their peaceable and loving toughness and indomitability, are amazing. They are among the reasons I keep hanging in there as a believer, stumbling on against my tiny hurdles and paltry challenges. And finally, why do I protest the imprisonment of these seven extraordinary humans? Put it this way: under recurring harassment, mob violence and systematic persecution, the Baha’i community of Iran continues to exemplify the highest ideals of the peaceful, progressive future that most of the world’s peoples long for – that too many have despaired of ever seeing. This peaceable, lion-hearted population has long carried the hopeful ball of global harmony and civilization, and no matter how viciously they have been tackled, they never drop the ball. And these are a few reasons that I keep writing about, and believing in the ultimate redemption of, the Baha’i community of Iran. This is why the Yaran, the Quietly Magnificent Seven, are my heroes. Now, as for the Iranian government: the so-called “Islamic” Republic, and its so-called “Islamic” theological apologists and inciters, have given many scurrilous, ridiculous, and transparently false justifications for locking up the Seven. WHY THESE SEVEN? Someday, history will show us, will show Iran, that these seven not only brought honour and great dignity to their country, but also that the community they served was a harbinger of the best of things to come.